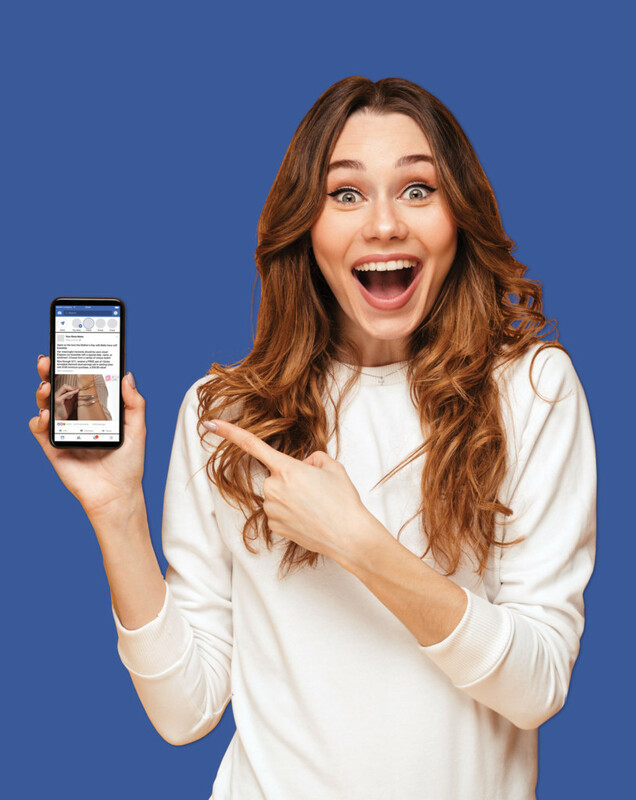 Turn your social media account into a powerful and cost-effective advertising vehicle that will create more engagement with jewelry consumers in your market, drive new shoppers to your store, and generate increased sales. Maintaining an active social media presence is necessary to reach today’s jewelry shoppers. In fact, with the right strategy and expert knowledge, your social media can have an extremely positive effect on your sales. That’s why we developed the Harmon Social Media Program for retail jewelers. It’s designed to build awareness of your store, drive consumers in to buy, and allows you to reap the full benefits of social media. According to Facebook, only 15-20% of people you reach through a boosted post (posts that use paid advertising to target a specific audience) will respond to you. When we run social campaigns for clients, our boosted posts consistently see response rates of 35-55%. That’s better than double the average. Our photographers and videographers have been creating stunning images and videos that feature the products from our partnering manufacturers. Consumers may have seen the products in ads previously, but because the content is fresh, they’ll actually stop scrolling and look. And of course, every newly created visual follows best social media practices. To accompany the new product visuals, our writers compose descriptive copy that speaks to a specific group of consumers (depending on the featured product) and encourages them to take an action. Not only do our writers understand how to communicate with jewelry shoppers, but they know how to do it via social media. Based on the copy, we then target and boost each post to that same group of specific consumers, using demographic and psychographic factors. Because we target at each step of the program, you’re given the opportunity to experience the greatest results. If you have special events coming up at your store, including trunk shows, holiday parties, and big sales, we’ll create additional boosted social media posts to help spread the word among jewelry shoppers in your market. It’s the easiest–and most cost-efficient way–to increase attendance at you events and get consumers to make purchases. The majority of our partnering manufacturers are including some kind of offer along with their featured products. These can be anything from, “Buy this product, get this other product free,” to “Spend this amount and get this product free,” etc. These are time-sensitive offers, and are unique to this program–they’re not being offered anywhere else. These are great incentives that will encourage consumers to take an action, visit your store, and buy. This program is focused solely on boosted posts; its focus is on generating sales and making you money. However, if you want to continue to post organically (posts that include donating a product to a non-profit charity function, or a picture of a customer who purchased a customized necklace that she loves), we encourage you to do so. Your organic posts will complement these boosted posts. However, if you don’t post regularly, or forget, that’s okay. We post three days a week, and because they’re boosted, they’ll carry over for a few days. That means there will be constant communication with consumers on your social media feed. Responding quickly to comments or questions on these posts is important–it can help you earn an Official Facebook Badge, which means you have a 98% or better response rate. This encourages engagement, and opens up more opportunities to develop customer relationships. We feel an important part of this program is to let you, the retailer, respond to all comments on the posts. You know your store and products best, and this is a great way to start that larger conversation. In order to cut down on your response time and make your day run smoother, we’ll set up notifications on your smartphone. This makes it simple to respond to questions, comments, and likes, and earn that Official Facebook Badge. 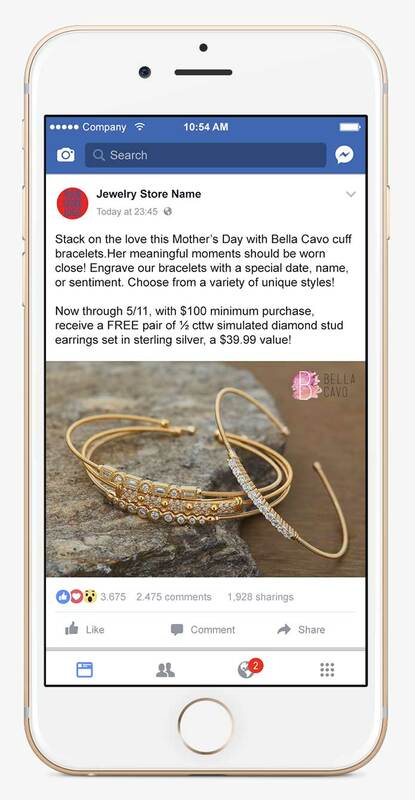 Qualified consumers are driven into your store to buy jewelry they see in your boosted Facebook and/or Instagram posts. We’ve learned all the intricacies needed to succeed in the social space, which is why our result rates are ten to twelve times greater than the average. We know what works, and what generates sales. Most partnering manufacturers are providing an additional product offer (discount, gift with purchase) that will make social media posts even more engaging for consumers and motivate them to visit your store. These are exclusive to the program, and manufacturers will cover all costs. Because this program uses geo-targeting, it will reach many consumers in your area who are not aware of your store. You’ll be introduced to people who live in your market, but have not yet walked through your door. Every dollar invested is targeting a specific audience who is interested in your product and is located in your market. Money is not wasted reaching out to shoppers who are too far away or aren’t interested in jewelry. Whether you carry multiple brands, sell your own product, or do both, we will customize this program to your store. There are currently over 100 of the finest manufacturers in the industry partnering with us on this program. If there’s one you work with that’s not on the list yet, we will acquire them. Our photographers and videographers have the equipment and skills needed to create high quality assets. Our writers know how to craft targeted copy that will connect with consumers. While our social media managers will meticulously manage the entire program, they do step back and let you respond to people who comment on posts. We understand that you know your store and customers best, Because this is the first point of engagement, it’s a great opportunity for you to welcome that buyer in. By participating in this program, you’re ensuring that your social media presence is continually active and growing. This increases your store’s online credibility. If you don’t have time to post for a few days, you can rest easy knowing that you’re covered. Our list of partners is still growing. If you work with a manufacturer not yet on this list, we will reach out on your behalf and ask them to participate. Manufacturers partner with us because they know who we are, they understand this program, and they know it will be successful. We’re adding more manufacturers and more samples every day, so please check back often. Don’t see a manufacturer you want? If you work with a manufacturer not yet on this list, we will reach out to them. reserve your market territory today! The Program launched in October, and our retailers have already experienced great success. There’s still the opportunity to sign up and get exclusivity to the manufacturers you want for 2019. Choose from our list of over 100 partnering manufacturers, promote your store brands, or feature a combination of both. The program is customized for your store. We’ve partnered with over 100 of the industry’s best manufacturers to create eye-catching visuals and video that showcase best-selling products that are uniquely theirs. Our photographers and videographers use their expertise and top-of-the-line equipment to capture every shot, and our copywriters produce descriptive, emotional copy to pair with the finished visuals. Whether you carry many of these manufacturers, sell your own store brand, or sell a combination of both, we will customize this program for your store. You choose which manufacturers you’d like to promote, and we’ll post the visuals and videos with the accompanying copy to your Facebook and/or Instagram three times a week. Using paid advertising, we’ll boost these posts to a precisely targeted audience based on demographic and psychographic factors, which can include interests, age, gender, and tax bracket. We’ll also use geo-targeting to target shoppers in a certain radius from your store. This ensures that only those consumers who live in your area and who have an interest in your products view those posts. If you have a special event coming up in your store, such as a trunk show, holiday party, or major sale, we’ll even create additional posts to market those. This will help spread the word to jewelry shoppers in your market, and drive them to attend your even. We’ll do the work of boosting posts and getting consumers excited about your product. However, we think it’s important that you respond to their questions and comments. You know your store and products best, and this is a prime opportunity to spark that initial conversation which can develop into a customer relationship. We even make it easy for you to be notified on your phone when someone has responded to a post, so there’s no need to go to a computer. At the beginning of each month, you’ll receive a monthly calendar outlining the products that will be promoted in posts on specific days, so that your inventory stays up-to-date. Because we believe in total transparency throughout, at the end of every month, we’ll provide you with the previous month’s analytics, which will come directly from Facebook and Instagram. These analytics will show how your posts have performed, and break down the number of targeted people they’ve reached, the number of times they were shown (impressions), and the number of people who took an action after seeing them (including liked or commented, sent a message, etc.). Because we understand that you might want to continue updating your store’s social accounts, we’ll also give you a “Tips and Tricks” sheet that has helpful hints, trends, and the latest information. Important note: We fully protect your privacy. We sign a nondisclosure agreement upfront, stating we won’t share any communication that passes between you and the people who are engaging with you through this program. From just the monthly and weekly costs, you’ll experience more engagement with jewelry shoppers in your market, and make more money. In the two weeks leading up to Mother’s Day, we implemented a social media campaign for ten retailers. It promoted a single manufacturer, and included a special offer to drive consumers into stores. We shot two propped stills and a :15 second video, and wrote engaging copy about the product. We put these three posts on each retailer’s Facebook page, and boosted each post to a targeted audience interested in jewelry within the geographic area of the participating retailer’s stores. Retailers spent $50 on each boosted post, for a total campaign spend of $150 per retailer. These are the cumulative results of the ten retailers who took part in our pre-Mother’s Day social media campaign. *Includes liking and sharing a post, contacting a retailer, etc. We implement every element of the program at an expert level while keeping your costs as low as possible. Our recommended cost for boosting the two weekly posts is $40 a week. This money goes directly to Facebook and/or Instagram, and can be altered based on how the posts are performing, as well as other factors. Our recommended cost for boosting the three weekly posts is $100 a week. This money goes directly to Facebook and/or Instagram, and can be altered based on how the posts are performing, as well as other factors. Once you enroll, there is a six-month obligation to remain in the program. We want retailers that have fewer social media followers to have time to build their audience and see results. We’re a full-service marketing and advertising agency that’s worked with a broad range of companies in the jewelry industry for over 30 years. The Harmon Catalog program has allowed us to build relationships with numerous manufacturers over the years which will help us easily coordinate their participation. And our photographers and videographers, senior copywriters, and strategic social media managers will create high quality assets and manage the entire program, all in-house. Are you ready to put your social media marketing to work for you? What are you waiting for? Contact us now to get started!